CPSC's accumulated experience and technical capabilities on web-based training programs has eventually evolved into developing her own Moodle based Learning Management System and since then it is being innovated continuously to serve an even larger client-base in the field of technical education and training for human resources development with advanced and cutting edge training technology platform. With this capability, CPSC is able to provide a mode of open and flexible learning that may be accessed 24/7 by and technical education and training institutions in partner governments. Valued key feature of the CPSC OnCOURSE is its highly interactive design for a dynamic learning experience. Lectures can be delivered using pre-recorded videos-on-demand (VODs) on various sub-topics which are combined with simultaneous display of computer-based and other presentation materials. Since 2004, CPSC has successfully implemented the it's learning management system in most of the In-Country, Regional and Customized Programs. CPSC continues to develop and enhance the design and concept employed to ensure more dynamism and use of emerging software technologies and applications. Having developed in-house capabilities to make further improvements, CPSC actively updates and innovates features on the OnCOURSE to make it more user-friendly. CPSC currently presents its latest version of Learning Management System through the CPSC OnCOURSE, a dedicated website developed as a repository of all programs with online support which provides substantive knowledge content to authorized CPSC clients. 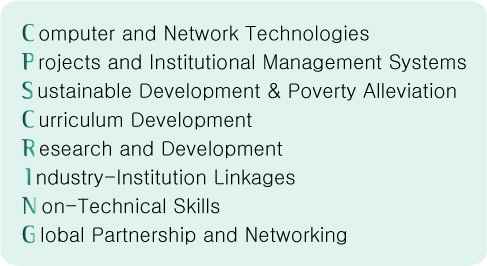 The OnCOURSE clusters previous and newly developed CPSC programs under identified sub-thematic areas of thrusts of CPSC more commonly called the CPSCRING. The growing popularity of blended learning as a training delivery mode among the member countries, high level of satisfaction of CPSC training participants from this mode, interest and appreciation of different international organizations, the growing body of knowledge on OnCOURSE and the vision and high level support from the leadership in terms of continued commitment in the provision of both hardware and humanware are just but a few reasons for CPSC to extend its services and continue innovating its blended learning system for human resources development in Asia and the Pacific Region.